More and more often, I find myself using smaller and smaller purses. They are the perfect size for all your daily essentials for a day out and about. I used to find myself carrying these huge purses without really needing half of what I brought with me and lugging a huge purse around can be quite a pain on your shoulder. No more unnecessary shoulder pain, I say! These tiny beauties are a great solution and with so many different designs, colors and details, you will have a tiny purse to go with everything. I have to say that one of my absolute favorite mini purses right now is the Kate Spade Mini Maise. I find myself reaching for it non stop since I got it in December. It’s just too adorable! I love the mini Duffie. That's gorgeous! I haven't carried a purse in so long, these all look gorgeous! These are all adorable! I definitely need to downsize! I don't even have kids and I wouldn't be surprised to find baby food and a pacifier in my suitcase–I mean–purse. This post may have inspired a good purse cleaning–thank you! I hope you have a great day! Oh my, I am a bag fiend, its the thing me and my boyfriend argue over most, haha! I looove the mini maisie <3 in fact I may now have to do a blog post about my favourite bags at the minute, you've inspired me.. I love small purses in summer. I don't see the point of lugging around a suitcase if you don't have to. I'm actually bummed when winter rolls around and I have to start carrying a bigger purse just so I'll have some place to stash my hat and gloves when I go inside. Ah, I am so obsessed with the Mini Maise!! I feel like it would go with EVERYTHING, right? Love love love. Love the mini Maise! What a pretty color! That mini Maise has my name written all over it. Need it!!! I love all of them! 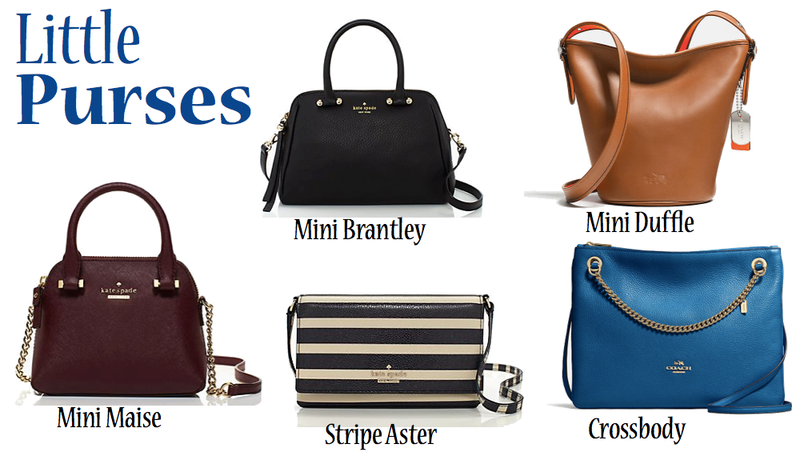 I love crossbodies so much but I think my favorite has to be the Mini Duffle! I am a hoarder with my purse… I have to have tons of room for tons of crap! Hehehe. The Mini Brantley is adorable. But then again, you can never have too many KS purses. I got a small Coach purse for Christmas and I love the size of it. I usually carry a big purse because I have all of my mommy stuff in it, but these mini purses would be great for a date night. I love little purses for whenever I leave the house without the baby since besides that I'm also lugging around a diaper bag! These are cute options! the stripe one is cute! but the love the mini Duffie is my fav! Love the look of the crossbody, I need a few of those as at the weekends when not visiting anyone just out and about i could do with them. I love the styles of these, I am more of a big purse gal, but it never hurts to have a small purse around too. I'd take any of these! They're all gorgeous! Love the mini duffle! So cute! I love little purses. Right now, though, my purse is way too big. It's mostly empty. I guess I didn't realize how big it was when I bought it. Ooh that striped one has my name ALL over it! SO cute! Teeny purses are so on trend right now! Too bad for me I feel like I have a hard time fitting all my things into a normal size purse!